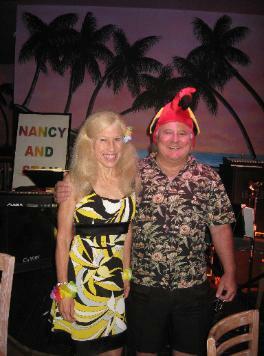 A couple years ago, Nancy and I were booked to do a Live Music show at “Cheeseburger in Paradise Restaurant and Bar” in Huntersville, NC, right outside of Charlotte. It was a pretty good ride from Raleigh, and schedule was minimal to say the least. So, in order to alleviate screw-ups and expedite travel, I used 3 mapping systems. Nancy and I each had one on our cell-phones, plus I printed one out to take with us – all different systems. So, as electronic stuff is, all 3 were a little different but two were close. So, that’s what we used. After a whole lot more driving and turns than I thought necessary, we were nearing our destination and just barely in time…..but remember, these are musicians. It was winter so it had already turned dark, but we were almost to our destination. Suddenly there were no lights except a red-light. Town had gone dark! I turned left at the light as directed and drove another half mile and stopped as directed. All I could do was holler to Nancy to hurry up and unload and get ready cause we had one of the largest captive audiences tonight that we’d EVER played for! I began to laugh insanely, almost demonically too. Nancy didn’t’ say anything, but her eyes had that “Deer in the Headlights” look. I flashed my super-duper hand light outside: we were getting ready to play in one of the largest cemetaries I’d ever seen! All kinds of beautiful stone work out there….with nuttin’ moving. So, we had to backtrack and ask someone where we were headed and found out the Interstate installation had cut our street off, so we were within a mile of where we were supposed to be but you couldn’t get there directly. That just added another 15 miles or so to the trip! It was SNAFU as normal, even with the best of plans! We finally made it to “Cheeseburger in Paradise”, rushed to unload and set up our sound system, and started the show on time, glad that we could keep our record of never starting late. The “Live” audience was Great, energetic, and sang along with us on many favorite Buffett songs! The customers, along with colored lights all around the restaurant and tropical decor helped made it an enjoyable experience for us all! A few of our most popular songs that night were Volcano, “We Are the People Our Parents Warned Us About“, “Margaritaville”, and (of course) “Cheeseburger in Paradise”!